As they say, good things come in threes. Following that typical rule, today we have in for review the newly released Archimede Pilot Chronograph Trikompax (Trikompax). We’re (happily) familiar with this general line from Archimede, having reviewed the Pilot Chrono here. We were pretty smitten with the original Pilot Chrono the first time around, so the Trikompax has a lot to live up to. Let’s jump into it. The first point of difference with the new model is the dial layout. The Pilot Chrono runs with the 12, 6 and 9 register layout, with the Archimede branding sitting next to the 3 o’clock marker. The Trikompax includes a new module to shift the subdials to the 3, 6 and 9 register layout with the Archimede branding at 12. Written down, that doesn’t sound like a big deal, but in this case, a picture does speak a thousand words. What you can see is that the balance of the dial is shifted from the left to the bottom. While it’s all a personal preference, the current layout seems to give more room to the Archimede branding at 12 and creates a more spacious feel to the dial. The reshuffle has also allowed each of the subdials to be same size, whereas the original Pilot Chrono had a smaller running seconds at 9. While the smaller subdial didn’t bother me at the time, I do have a preference for the updated arrangement. The original Pilot Chrono included Arabic numerals for each hour, except for the subdial at 6, whereas the Tricompax removes the 3 and 9 numerals and slightly cuts through the 10 numeral. The reshuffle has also meant that the AUTOMATIC branding has been removed from the dial. While that branding certainly wasn’t too obtrusive, I’m always a fan of moving more towards simpler dials with less text. Something that could easily have gone under the radar is the change from black lacquered hands to blued steel hands. The shift pulls the hands further from the dial and as always, creates an interesting play with the light. Another nice touch is that the centre wheels of the subdials have been blued/painted to the same hue of the hands. Finally, the new layout also provides an interesting point of differentiation for the Trikompax. While the stock Valjoux 7750 provides the typical register layout that is utilised across numerous brands and varying pricepoints, the new layout really decreases the direct competitors to the Trikompax (if you are in the market for the 3, 6, 9 layout at a similar pricepoint). has a better daily rate +/- 4 vs +/- 7 seconds (etc etc). Long story short, the movement is better constructed with upgraded features. While I haven’t had any issues with my elabore 7750 watches (nor with the original Pilot Chrono), the upgrade cannot be a bad thing. What my (untrained) eye can tell is a nicer finish visible through the sapphire caseback, with blued screws, better perlage on the flat surfaces and better application of brushing on the other surfaces. The cam-operated chronograph provides a consistent and satisfying detent on the start, stop and reset of the chronograph, and the movement of the minute hand along that subdial hits the markers nicely. Something that surprised me handling the watch was the satisfying tactile feel of manually shifting the date, which provided just enough feedback to set itself apart from the many other dated watches. The Trikompax is said to have an updated rotor from the previous iteration, but to my eye there is just a minor reshuffle of the positioning of the branding and potentially a slightly different finish. We’ve mentioned before that the tool watch aesthetic is best served by a undecorated steel caseback, but certainly it does not harm to the appeal of a mechanical watch to show its beating heart. It’s difficult to criticise Archimede broadening the appeal of mechanical watches to non-WIS that like to see what’s inside that has (in no small part) caused a premium over quartz models. Once again, I was pleasantly surprised by the feel of the Trixompax on the wrist, which case is the same as with the Pilot Chrono. The height comes in at approx. #, which to some can sound a bit unwieldy, but the 3 part construction of the case breaks the visual lines of the case nicely and the height is no bigger than some divers I regularly wear with single pass natos. The relatively thin bezels certainly give a lot of dial real estate for a 42mm watch, which is a bit of a change of pace from someone regularly wearing sub 40mm pieces. However, the lug shape and curve go a long way to assisting the watch sit comfortably on the wrist. Purchasers have the option of a number of riveted pilot straps and a 5 piece bracelet from Archimede (the bracelet have an approx 100 euro premium). The strap is thick but supple and well constructed. 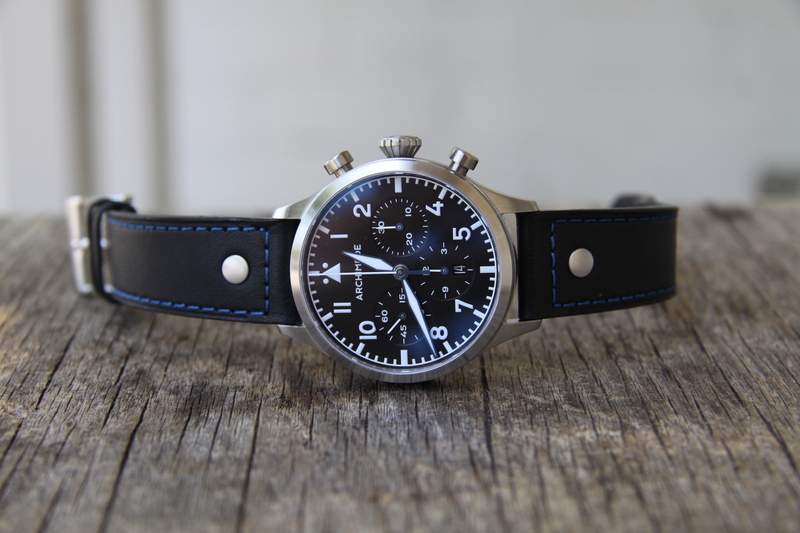 We choose the blue stitch, which nicely matches the blue accents on the dial. Together, the updates to the Trikompax give it a different feel and make it a different proposition than the Pilot Chrono. Unsurprisingly thought, with these changes come a not insubstantial price increase to 2067 Euro (without VAT). The value proposition here really depends on how you characterise the watch. Measured against the original Pilot Chrono, which is a fantastic value proposition in itself, any prospective purchaser would really have to put stock in the aesthetics of the new dial layout or give some pretty heavy emphasis on the upgraded 7750. Alternatively, measured outside the brand and against watches of similar quality and aesthetics, the Trikompax certainly is a compelling proposition. Other German brands don’t really have in their stable top grade 7750’s with the 3/6/9 layout (with the exception potentially being the Sinn 903), and in Swiss territory, Baume et Mercier and Hamilton are moving in different directions. Seiko traditionally provides a different aesthetic and doesn’t have a huge stable of aviation inspired chronographs (at least modern ones at that).